Tonight I was having Thai food for dinner. I like matching the food I eat with beers so Bangkok's Chang beer was the obvious contender. It's not the countries highest selling beer, that honour belongs to Singha, but it's arguably the best known beer. 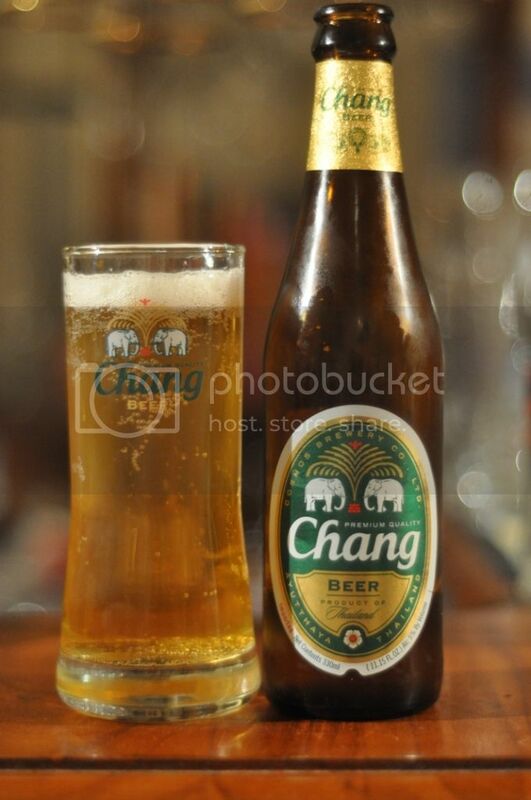 Chang have only recently begun to challenge Singha both at home and abroad. The beer rose to international fame in 2004 when they became the front of shirt sponsor for English soccer team, Everton. I've had this beer quite a few times and normally end up very drunk so I can't really remember what it tastes like, it might be time to find out (again!). When you crack the top off there is a beautiful hiss of carbonation escaping. The pour is a nice golden yellow colour with plent of carbonation rising to a fast disipating brilliant white head. The head has rather large bubbles throughout it and is gone less than a minute after pouring. In it's natural environment this wouldn't be a problem as it's so hot and humid in Thailand that the beer would all be gone by then! The nose is very light, there's hardly anything there at all like almost any South East Asian lager I've ever had. The overall aroma is slightly sweet with some very faint grassy hops towards the back end. As I say with almost every tropical lager, as long as the beer doesn't smell offensive then the nose is fine. So by that scale Chang is a fine smelling beer. Lager connoiseurs stop reading now, this isn't the beer for you! This beer is designed to quench thirsts in disgustingly humid weather not be a technically perfect or interesting lager. Much like the nose it's a very simple beer, with flavours of mostly sweet grain and just a hint of bitter grassy hops at the end of the palate. The finish is crisp and dry and very refreshing.